The peaks and valleys of Southwest Virginia embrace the Blue Ridge, Allegheny, and Cumberland mountains in the Appalachian chain, offering numerous opportunities to experience the beautiful sight of waterfalls. Many lie close to the road, allowing easy access, but others require a challenging hike. It’s easy to understand the popularity of the Cascades in Jefferson National Forest. Several streams, multiple falls, swimming holes, picnic sites, and a four-mile hiking trail present a variety of sensations, like the movements of a symphony. The crescendo comes with the 66-foot waterfall that crashes into a large pool surrounded by 200-foot cliff walls. Wooden stairs and platforms make the falls accessible to many hikers. From Pembroke, take Cascade Drive for 3.6 miles to the parking area. The three distinctive falls and the pools of Tumbling Creek lie along a rutted gravel road. Big Falls drops a sheer 12 feet. The 10-foot upper falls present like a set of natural stairs, wispy channels of water streaming down each step. And two creeks fall 40 feet into Big Tumbling Creek to make Twin Hollow Falls. As part of Clinch Mountain Wildlife Management Area, the creek appeals to trout fishers, too. From Saltville, take Allison Gap Road. In 1.5 miles, turn left onto Poor Valley Road. Go 3.8 miles, then turn right onto Tumbling Creek Road. Drive 4.5 miles to Twin Hollow Falls. If you’re ready for a gentle cascade that also serves as a relaxing swimming hole and slide, Fox Creek awaits. The short trail from the road makes the scene easily accessible. Flowing between the south side of Iron Mountain and the north side of Mount Rogers, Fox Creek is sheltered within the Mount Rogers National Recreation Area. The lower section of the creek flows through a small gorge, dotted with boulders, creating pools of water that beckon bathers on hot summer days. From Marion, take Route 16 south. Go 18 miles and turn right on Route 603. Go about 2 miles to the pull off. This majestic, easily accessible 80-foot tall waterfall is one of the most visited and photographed spots in the Alleghany Highlands. Thomas Jefferson described it as a "remarkable cascade…falling over a rock about 200 feet to the valley below." Though the streambed was later moved to mine fertilizer, the cascade is still a respectable 80 feet high. The falls are now owned by the Virginia Department of Conservation and Recreation—no more fertilizer mining. To get there, take Route 220 in Alleghany County 5 miles north out of Covington. The falls are easily visible from the roadway. The sight of these impressive waterfalls is a reward reserved for the hardy, experienced hiker. Access to this ecosystem of rare plants and animals is on private land, with no developed trails. Landowners grant access to experienced hikers "who agree with our mission to help conserve this pristine wilderness" and who acknowledge the dangers of the hike.” But the waterfalls are worthwhile for those who can tackle the challenges of the 1-mile, out-and-back hike. You’ll be among the few to view the 75-foot-plunge waterfall, impressive pool and natural amphitheater, a secondary cascade rushing over ledges for another 15 to 20 feet, and a horseshoe gorge, all surrounded by unspoiled nature. Click here for more information and permissions. Not content to see a waterfall from the front? Little Brumley Creek Falls is the hike for you. Just before Little Brumley Creek joins Brumley Creek, the waters plunge 20 feet over an abutting rock slab. You can navigate to the deep crevice behind the falling waters for a novel vantage point. Continue down Brumley Creek to take in several more cascades. Located in the biologically diverse Clinch Mountain Wildlife Management Area, navigating to the trail requires a bit of bushwhacking. Easiest access is from the Hidden Valley Lake dam. From Abingdon, take Route 58 ALT-W / Route 19-N for 10 miles. Turn onto Hidden Valley Road, go 2 miles to the lake, to the dam at the far end. 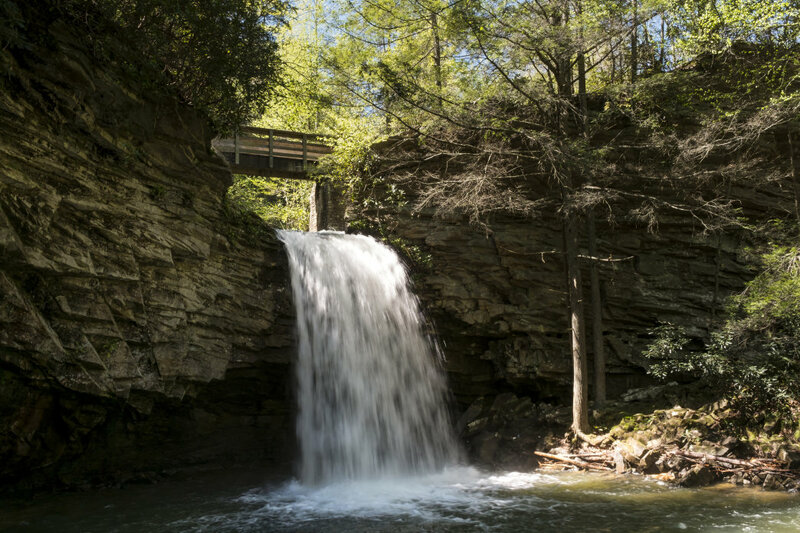 Three distinct waterfalls greet visitors along the 2.8-mile Little Stony National Recreation Trail in Jefferson National Forest. The trail follows the stream through a 400-foot-deep and 1,700-foot-wide gorge, with footbridges at water crossings. A viewing platform just a half-mile from the trailhead makes it easy to ogle the 40-foot lower falls, a wide veil of water framed by rhododendron. The middle falls is next, a 10- to 15-foot cascade, followed by the 25-foot vertical drop at the upper falls. To access the Hanging Rock Day Use Area from Dungannon, take Route 72-N for 3.6 miles. Or travel from Coeburn on Route 72-S for 8.6 miles. A sign marks the trailhead. 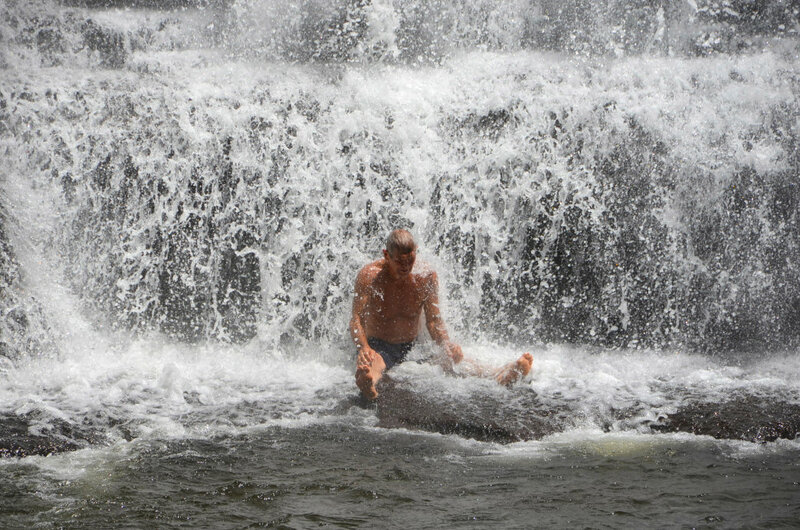 Several cascades will entertain you along the 2-mile loop trail to two large falls. The trail winds across streams and through rhododendron thickets, with numerous swimming holes along the way. The 45-foot waterfall consists of three channels plunging into the pool below. The 60-foot waterfall channels a single stream rushing over the boulders. Located in Grayson Highlands State Park, the trails are well traveled and maintained. The Cabin Creek Trail can be accessed from the park’s Massie Gap lot, 3.5 miles from the entrance.